I’m a proud mom to my son Crosby and wife to my best friend Robbie. I started Build Your bite in 2014 as a way to document my journey through the world of vegetarian eating. Growing up, my parents were divorced and I spent most of my teenage years living with my dad and 3 brothers. During this time, I learned how to cook through trial and error after I got sick of eating one too many frozen dinners à la my dad’s specialty. A few years later, I decided that I wanted to become vegetarian and was vegan for 6 months. Although I’m no longer strict vegan, I still enjoy many vegan recipes and you’ll find lots of them on my blog. When I met my husband, he was a meat and potatoes kind of guy and an ultra runner who ran 30-50 miles a week. We didn’t have a lot of money, so most nights were spent at my house cooking dinner together and those are some of my fondest memories. After a few months of me introducing him to a new world of delicious eating, he decided on his own to become a vegetarian. Since then, Robbie has ran 50k races, 50 miler races, and more all on a vegetarian diet. Not to mention he is a landscaper with a very active job every day to begin with. He will be the first to tell you that not only is it easy to eat healthy, but he eats better than he ever has! I’m so blessed with a supportive husband that loves healthy eating just as much as me! He loves everything that I cook and is the biggest supporter of my blog. We had what some might call a whirlwind romance. Our first date was New Year’s Day in 2014 and we were married December 20th of that same year. What can I say? When you know, you just know. Some people thought I was crazy (he was my first date), but three years later we are still crazy about each other. He is truly the best thing (besides my son) to ever happen to me and I am so thankful that he came into my life just when I needed him. We welcomed our first son Crosby in 2016 and he is the light of our lives! 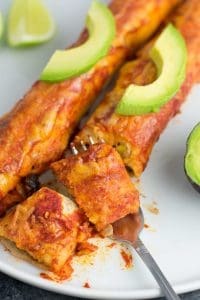 My goal with this blog is to share recipes that prove not only is it easy to eat healthy, but it is seriously delicious! You don’t have to be a vegetarian to enjoy my recipes! So many people think that becoming healthy means giving up flavor, but that’s just not true. 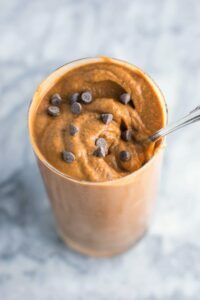 From healthy double chocolate milkshakes to strawberry cheesecake for breakfast to insanely good stir fry recipes, I share the meals that we both eat and love in our home. I love hearing feedback when you make my recipes! Whether it’s leaving a comment on the post or tagging me on instagram @buildyourbite and #buildyourbite, I would love to hear from you! If you have any questions or just want to say hi, feel free to contact me! You can also follow along on Facebook, Twitter, Instagram, and Pinterest!